Anahera Press will be officially launched on Sunday 11th December, 2-5pm, in the old Jewish Memorial Hall space, 70 Karangahape Rd, Auckland Central (by the Rock Shop). Come and join us for a glass of wine, some food, and poetry from Anahera poets present and future: Daren Kamali, Doug Poole, Tracey Tawhiao & Ben Brown. With an art exhibition featuring the work of Munro Te Whata (illustrator, Tales, Poems and Songs from the Underwater World), and Tracey Tawhiao. Daren Kamali’s book will be available for sale and signing by the author. 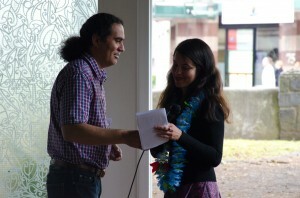 We are delighted that Anahera will be officially launched by renowned Maori poet Robert Sullivan. All welcome.